I made something! It's taken me long enough I know but who cares! I bought three of the new stamps designed by Elisabeth Bell at Funky Kits when they came out and finally got round to using one! Of course, it had to be the Kitty stamp which I think is adorable! Kitty stamp, gorgeous K & Co McKenna papers, a bit of background paper from Basic Grey 'Sugared', antique cream grosgrain ribbon, SU! ticket corner punch and the 'here kitty kitty' stamp is also SU! I can't remember what the set is called but I believe it's retired now - I bought it and another cat set from a fantastic seller on eBay. Now, this may surprise you but this is for my friend Kitty's birthday! Lol! Another 25th today so lots of photos taken for Shimelle's Scrap Your Day project - pretty much the same as last month for me although I got some great photos of the sunset this month. Last month was hideous weather so it's nice to see the sunshine! I seem to be jinxed when it comes to UKS cyber crops - I somehow managed to do something to my right arm last night and now I can't move it :( Can't write or cut or even stick! General opinion seems to either a wrenched muscle or tendon or a trapped nerve in my arm! I'm having to type with my left hand so if there are any spellling mistakes I apologise in advance! i do have something to show though -the first 3 pages in my 'Scrap your Day' book! This is another fab project by Shimelle and is to photograph your day once a month on the 25th for the next 12 months! Not a happy bunny - set up a post to automatically get published and it didn't work! Can't remember what I said so my rambling from yesterday is lost forever! Lol! Anyway from 7pm tonight until 9pm on Sunday night I shall be cyber cropping - first class involves doing something with this! Yes, I actually have something to show! I made a wee notebook yesterday, to keep a record of Bazzill matches withh pp, what I've received in kits and a list of all my stamps! 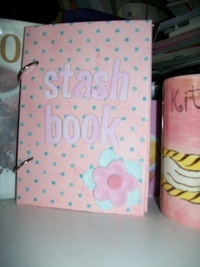 I call it the Stash Book! Lol! It's only small so I'm thinking I might make a bigger one just for my stamps as I have rather a lot :-) This is the one that I made last night - it's got wee tabs inside that you can't see so it's divided up into sections, I may add a record of stash spends but as I'm currently a S.A.D. there isn't much spending going on! So hard to get a decent pic at the moment - the few gloriously sunny days we've had over the last week have gone to be replaced by grey dreary skies - again! Anyway, the pic is good enough to give you a rough idea of what I meant - It's covered in Bo Bunny from last February's Scrapagogo kit, Bazzill Bling on the inside covers, felt flowers & brad from this January's Gogo kit and chipboard Thickers inked with Stazon Blush Pink. I shall probably go bright with my stamp book - can't make that until I've made & finished a Mothers Day card (made my Mum's birthday card tonight so will show you that tomorrow night, little sis please don't tell Mum what it looks like!) and finished a cj entry! Last but not least, there's a sneak peek of the Little Cotton Rabbits kit from Sugar Nellie - shall be checking all day every day so I can reserve one of those! Oh, and I caved today & sent Monica a SU order - ooops! And thanks to my Scrapdragon team-mate for the title - shamelessly stolen! Lol! I finished off my recipe cards for the Follow the Leader Recipe Card Swap - the theme this month is Soup! No problem for me as I love making soup but as dh won't eat any of them I never really get to make any. The recipe I did was Carrot & Bean - one of my favourites! I'm an awfully slow scrapper on the best of days but 2 piddly 6"x4" cards took me nearly 3 hours! Lol! Probably not helped by the fact that I've bizarrely crammed myself into one tiny corner of my table! Found another stamp company in the US that has some fabulous stamps but I've given my plastic to Grandad (again!) and i will not ask for it back! Need to sit down and go through all my stamps - now I have so many I'm a bit worried about duplicating. I already keep a list of all my Magnolia 'Tildas' and my Sugar Nellies - think I'm panicking slightly about how many stamps I actually have! Just hope dh never actually twigs how much even unmounted stamps cost because I could be in trouble. Will take photos of recipe cards tomorrow in the sunshine, along with cj's and cards! Off to bed as I'm a sleepy scrapper today! As well as signing up for the Elsie challenge on UKS and the A - Z Art Journal i've just signed up to do this as well! I'm determined that 2008 actually means i do a lot more scrapping this year so i figured the 3 above items are going to be a good way of doing so :) I also signed up to a '2008 targets' thread to say that my target is going to be at least 1 layout a week so here's hoping i can do it! The 365 days challenge looks really good - the only think i'm worried about is the self-portrait photos! Looking forward to starting that on Tuesday though, which will also be the first day of the official stash diet! I've had a practise run and not bought anything since yesterday evening! Lol!!! No more stash buying for me until i have enough money to buy a Cricut Expression and at least 5 cartridges - that'll be this time next year then! Been to my crop at Fat Freddies tonight (out for the first time since i left hospital!) - the challenge was to bring something from the kitchen that could be altered. I couldn't make my mind up so took a jam jar and one of the buckets i keep my baking spatulas/spoons in. I used the bucket in the end and turned it into a pen pot - i know, very original! - by sponging on pink paint then using letters cut on the Cricut to form a mask to print the letters in a darker shade of pink. I shall punch some holes around the top in the morning using my crop-a-dile and thread through some of my ribbon scraps. I ordered a bejeweller last week from one of my favourite online shops and i'm really disappointed as it still hasn't turned up. I've emailed them but had no response so will have to chase it up on Monday unless it arrives tomorrow. Been browsing on that auction site for a couple of hours tonight too, found a reasonably priced set of Letraset markers so i've put in a cheeky bid and also got a cheeky bid on some Marvy pens. Was trying to find something else as well but when i went to search my mind went completely blank! Must spend the weekend doing stuff as i've got 2 cj's to make and a cj entry to do in the recipe cj. I know, i haven't posted for days again! I have been rather busy though - there's been lots of stash to buy! The new printer is fab - it's so nice being able to print stuff when i'm scrapping. I finally finished my recipe card and sent it off, i did marmalade chicken for my recipe but forgot to take a photo of the finished card. I've signed up for next month, desserts/puddings this time and 2 cards to make. I finished off my Recipe cj - it was so weird to be doing a cj again but i love them! - and sent it off. I got the next one in the group this morning and i'm a bit worried now that mine is too simplistic. I need to dig out my chipboard and get cracking with my manufacturers cj as well. ! I went to the crop at Fat Freddie's and it was fantastic! The 2 & 1/2 hours went so quickly and i finally figured out maze books - in other words they now look right, unlike my previous efforts! Can't wait to go to the next one - it was just nice to be out of the house for a while. Loads of other stuff to tell you but shall leave that for tomorrow. I've got to go & make bread (rosemary and olive oil) to go with tonight's dinner - be back later! Hooray!!! My new printer is up and running, i've already used it to print out some stuff for my recipe card (which i've not actually put together yet) and it's fab - prints really well! Look out for lots of stuff featuring printing coming to a blog near you soon! The buttons i won on eBay arrived this morning, along with my secret stash order from ATDML and some wool i ordered before i went into hospital that i'd completely forgotten about! Found a similar piece of fabric to the ones i missed out on from eBay - it's a little bit cheaper too so think i might have to splurge tomorrow. I also found some really cute Ki Memories stamps to do with cooking - not in this country though unfortunately and i'm not sure i can justify a US stash order for the rest of this month, or at least until i hear from the evil form headquarters. Fingers crossed i am still escaping tomorrow night for the crop with my new UKS buddy - will be lovely to get out of the house and to actually make/do something without interruption. One small problem though, actually two - i can't get to my tote as it's buried with junk and i can't find my self-healing cutting mat anywhere! Will have to have a quick look tomorrow but can't think where else it'll be. Oh well! It's true - once you start you can't stop! I tried out my recipe yesterday that i'm going to use for the first recipe card swap and it went down really well, apart from the fact that i had to sieve out the garlic and dh didn't get enough mash - he couldn't pinch any of mine or GD's because we had spring onion in ours. It went down so well that we're having it again today, with a few little tweaks - just as well really as i forgot to take any pics and a picture of an empty bowl just doesn't look the same! Looks like i might finally get to go to the monthly scrap session that Fat Freddie's run on a Tuesday night. I signed up to go to one back in May but with being poorly and then being in hospital i never got to go. One of the girls in my new circle journal actually goes to the session so i'm going to go with her as she has very kindly offered me a lift! So, hurrah!!! My very first crop, so to speak - and only 3 years after i first started scrapping. I just need to dig out my totes now and figure out what i need to take - if i start now i might be done by a week tomorrow! Yep, today i actually got to make cupcakes from start to finish without anyone changing their minds!!! They came out really well, not being big-headed or anything but they're just about perfect - did i mention they're blue??? The cake, the icing - both blue....................... It was a bit of an ooops moment, was trying to get the lid off the food coloring and it flew off, followed by its contents into the cake mix!!! Still, they came out fine and they ended up just as good as my Pink Cupcakes :) Will put some pics at the end - even the Lump got in on the act! Yes indeedy! Today was definitely better than yesterday which, let's face it, couldn't have been lazier! I started the day with the dreaded 'h' word and got two loads of washing done, followed by a mountain of ironing. Today's dinner plans hit a glitch when i discovered there wasn't enough pasta left to make tuna pasta bake - dh's Grandad offered to go to the local shop to get some, and came home with tagliatelle! Not exactly the best pasta to bake in the oven - off to plan B, get dh to get pasta on his way home. This didn't work either, all he could find was spaghetti! Why is it so difficult to find a bloomin' bag of penne or fusilli?? Dinner ended up being plan C - pizza! Most important crafty thing of the day was to make a card for Mum's 70th birthday - unbelievably i got one made that i was completely happy with in just over 20 minutes :) I wrote my usual daffy message inside, sealed it up and addressed it, then realised i'd forgotten to take a photo! As i didn't have any more of the right size envelopes left, i wasn't about to unseal it so i'll have to forget the pic for once. In the wake of my semi-success with the inchies i've signed up to do another swap but this time making thirty on a particular theme. I've got about 5 weeks to do them but i made a start on them tonight and cracked open the new sets of H20's - i think i've done way more background than i need but as i haven't quite decided on a theme i thought it best to have a variety of colours from which to start. Last but not least a fab new challenge from Sprogpaws - My Life in Lists :) I've got no hesitation about doing this one, in fact i can't wait to get started!! I'm going to spend a wee while before bed starting work on my list and hopefully, barring any disasters, shall get started tomorrow! Oh, and my Mini A - Z is still an ongoing project - i'm up to the letter E so far - but i will finish it. What did i achieve today? Something or nothing? Hmmm, let's go with the second option - nothing!!! It's just been one of those days when i've got up feeling motivated and gone to bed having done nothing. I did manage to cook dinner for all of us - a very scrummy spaghetti bolognese with garlic bread (or evil bread as Grandad likes to call it) - and i bought 2 stamps so i can send my inchies off! The only exciting occurrence of the day was the post - i received the 3 sets of gorgeous H20's i ordered on Friday :) That's the last of the massive stash binge i went on last week so no more new stash for me until the end of March when i hopefully get to go to the Papercrafts Extravaganza at Harrogate! I did have a fun moment when changing the water filter for my jug - i popped the new filter in and the water started coming through black! This is the second time this has happened but unfortunately this time round it's the last filter in the box, not the first, and i don't have my receipt any more. I had to send dh up to the shop to get me a bottle of mineral water but strangely he came home with 2 bottles of Lucozade! Well, today kind of went to heck in a handbasket! I didn't get much of anything done because the computer has been crashing frequently all day :( I've been kind of following the classes over on UK Stampers for the first birthday bash but not actually got anything finished - will hopefully get a couple of things done tomorrow and will try and catch up on the rest during the week. DH has said that if he gets his redundancy money on Wednesday as his ex-company have promised, he'll look into getting a new computer for me! I'm going to try and talk him into adding a new printer & scanner with that, will be completely sorted if he does :) A new computer will also mean i'll be able to finally upload the camera software and i can stop using my mobile to put pics on here. I started working on one of the projects out of the kit from Scrapagogo today - a cute little pocket book. I've made the cover and cut & stuck 4 pockets, just need to add the photos, tags and something on the cover, then it'll be finished. I thoroughly enjoyed doing the pocket book and can see myself making more - in fact Grandad has asked for one about the cats!! Never made it to the supermarket today as cat no. 1 has been poorly :( The poor little guy has been through a lot in his life, including major surgery and so i've spent the day looking after him. We called the vet and as she's aware of his condition, said not to put him through the trauma of taking him in unless he got worse. Thankfully he seems to be doing a bit better now and is sleeping peacefully in front of the fire. I didn't get round to trying the Scrapagogo project kit today - discovered i didn't have any foam tape left so a major flaw in the plan!! Instead i've started on my inchies for the swap over on UKStampers - i've done the backgrounds using a set of my twinkling H20's and then cut up them into the right size. Hopefully i'll get them finished tomorrow after the delayed trip to get food!! Dh got a phone call from the police today saying that they won't be taking matters any further. I'm so annoyed about this as dh discovered that someone tried to use his credit card on the other side of town in a shop that he's never been in :( Luckily it was refused as he'd cancelled the card but i just don't understand why nothing is being done - they're not even going to check cctv footage! Just in the middle of watching a fab new tv show called Heroes on the Sci-Fi Channel - so far both dh and i like it so i guesss that means i'll get to watch it again. Apparently it's a huge hit in the States and it has the actor who played Sulu from Star Trek in it. If i could only get him to watch Medium then life would be pretty good! I managed to finish off my challenge LO from my pal on UKS but i've not got a picture as it's been such a dark, damp, overcast day here today. Hopefully i'll get one tomorrow :) Inspiration has also struck as to what to do for the inchie swap i'm in over on UKStampers so hopefully i'll manage to get them done in the next couple of days and get them sent off.